I didn’t want to do anything today. But as I took Monday off, I was stuck with exercising in some fashion today. One should never take the first day of the week. Turns into a pattern as by the end of the week, I will be ready for a day off again when Monday rolls around. Mother Nature finally realized that it is January and perhaps she should be seasonal. 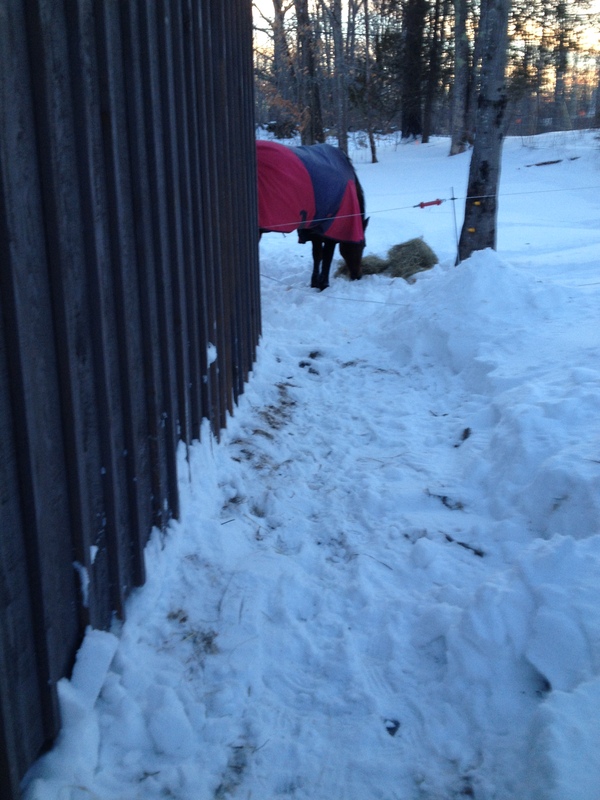 It was 9 degrees when I went out to feed the horse. I came back inside and had breakfast. After running to town (gotcha there, didn’t I?) with the husband, I decided that it probably wasn’t going to get any warmer and I better get out there. The weathermen were correct. We had snow, we had wind and then we had a bit more snow. This morning the day dawned clear and we could see the work in front of us. Well, perhaps we were looking a bit before dawn. My husband and I have a good division of labor: he plows and I shovel. 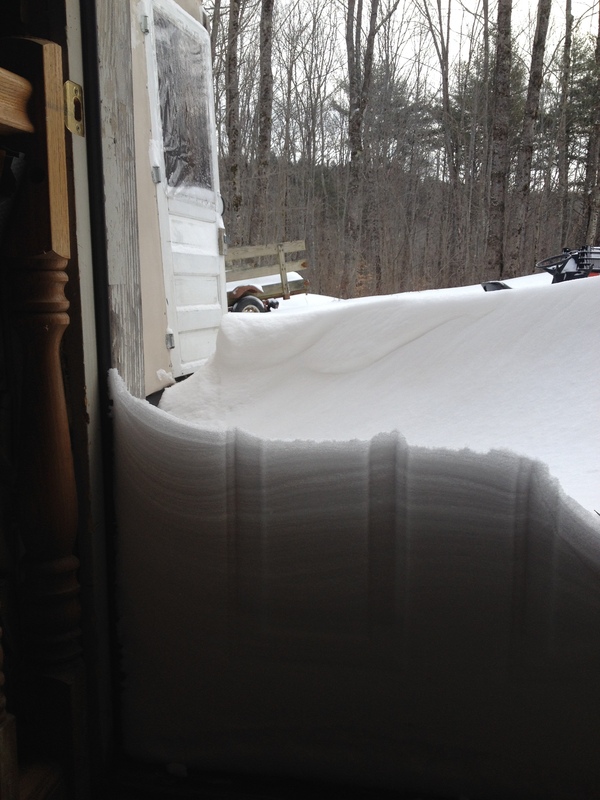 Fortunately for me, the blizzard deposited a large quanity of dry, light snow. I did the porch area before he left for work. 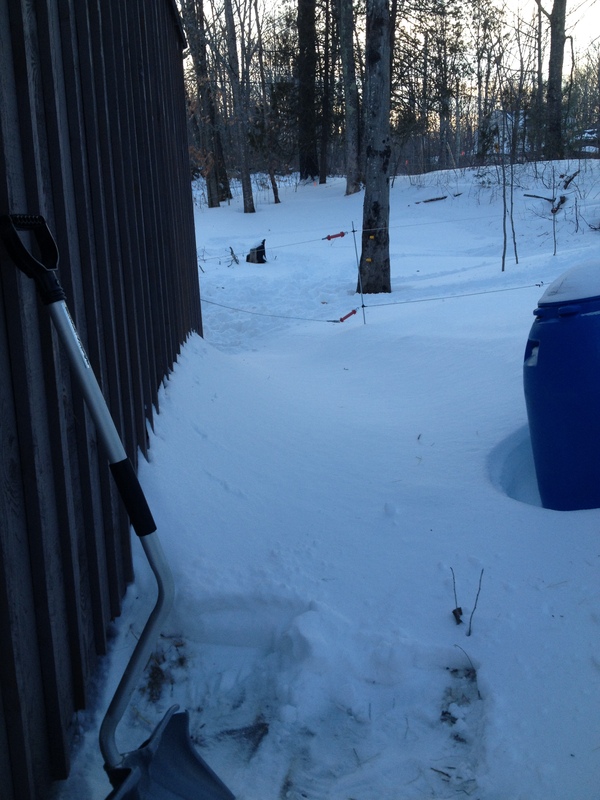 Then around 10am I needed wood for the stove…..
Keep in mind that after the shoveling, I still had to bring in the wood! 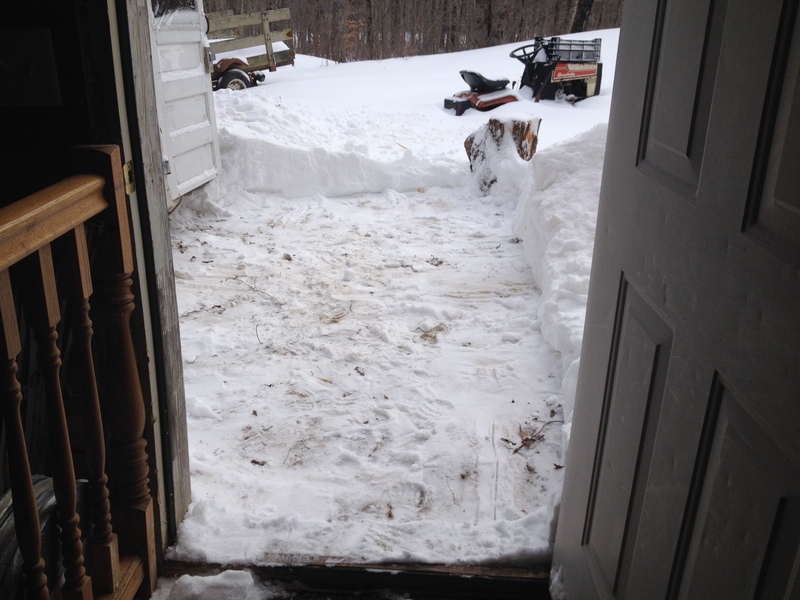 Then late in the afternoon I had to go dig out around the barn. Charby was not impressed that I shoveled before I threw her some hay. Feeling frisky in the brisk sunshine, she tossed her head and showed me her heels. Oddly, I did not feel the need for “traditional” exercise today! Mother Nature and I have a strange love/hate relationship. I love her in all her glory, and I think we all can admit that she is rather glorious. Mountains, oceans, forests and plains, sunsets. I will run for all of them. But, sometimes, just sometimes, I hate her as she decides to make it impossible for me to do anything outside. It’s not so much the cold as it is the precipitation. She, on the other hand, continues on her way supremely unconcerned with my feelings. But, the weather was extraordinarily temperate last week–at least, for Maine in January. It was between 25 and 35 degrees with no precipitation. So I laced up the sneakers and had the most miles in a week in just about two months. Sadly, that was still only 12 miles. Since I had not run routinely recently, I decided to do what I call a “progressive” week: I start the week with a short run (2m in this case), and then add distance to each run. So, after my 2m, I did 3m and then 4m. I did those runs every other day, and on the off days I did 1m runs followed by yoga. By Sunday I was beat! And while Sunday didn’t work out–I’d hoped to do a 5m–I did get 6 days of exercise in. In all, I would call it a good week. So what else would I like to do, that seems relatively impossible? Let’s see…..
1) Make wings like Icarus and fly…just not too close to the sun. Maybe I will only do this at night? 3) Make a “Peace Ray”: when people start to fight, it forces them to sit and talk like humans. Any harm done to another while under said “Ray” will come back on the person attempting harm. 7) Outlaw adding “gate” to anything that might at some point turn into a scandal. Too bad the DNC didn’t hold offices in a Holiday Inn! Now, that is just the running. If you look at all my sports, I burned 160 burgers, and, really, isn’t that the important part? Especially since I probably only ate about five burgers the entire year. What I actually need is to know how many pizza slices I burned. I did like that if you added all my run times together I ran over two days. I think I shall aim for a week in 2015. So, other goals for 2015? I have some definite ideas about how to improve my times. They involve a lot of lunges and pushing myself. I tend to slack on long runs. I think the hardest thing I am aiming for is an obstacle race. Running, sure, I can do that. Climbing over stuff, not so sure about. But it sounds like fun. Right? Right? *Pizza is my weakness and I generally have it once a week, so I may need to up that number! I am varying my workout week length right now, trying to avoid burnout. So while I normally only take one day in seven off, I am allowing two in seven if I really don’t want to exercise on a particular day. I did in fact take two this week, but I also went out in the snow and helped cut and haul wood on one of those days. 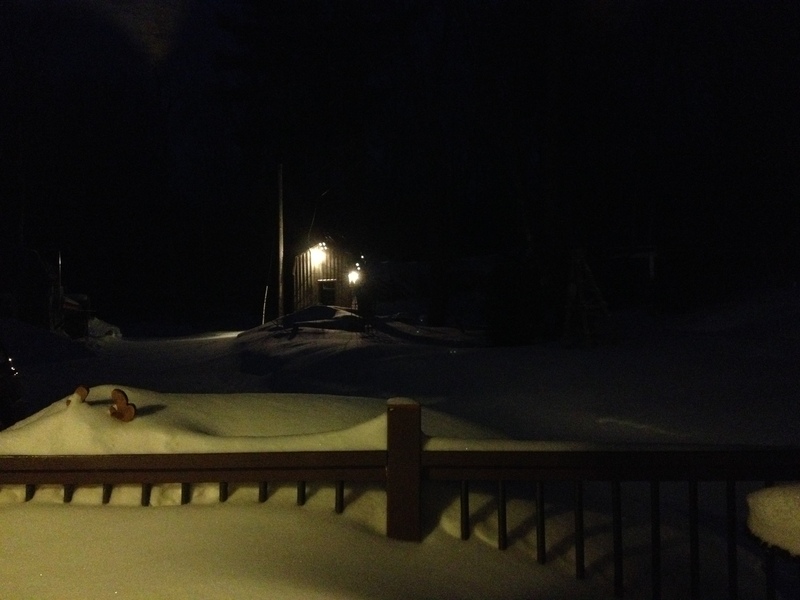 I love our wood stove–I just wish I didn’t have to go get its food. I did manage to get in 2 run/run alternate days, 2 yoga and 1 weight training session. I left the weight training until Sunday because I just really, really didn’t want to do it this week. Funny thing is, after I did it and was all dripping in sweat, it wasn’t that bad. Sometimes we make up monsters under the bed, and when we look under the bed, it’s just a dust bunny. Still, I am thinking I will get the weight training out of the way early this week so there is no dread involved. I allow a certain amount of flexibility in my workout schedule. I don’t go to gyms–one, I live far out in the country, and, two, if I had to go somewhere to exercise I probably would never do it! One great feature about this is that I don’t have to go to a certain class at a certain time. So a lot of my workouts are set upon when I feel like doing them during the day. I have an idea of what I have to do within the week, but I often leave it up to the day to decide what I am going to do. Works out fairly well except when I want to avoid a specific workout! What is your worst exercise? Do you do it early in the week or push it off until you have to do it….or skip it entirely for your week? Following Tempest Rose’s lead, this is my bucket list of impossibilities! 10) Crossbreed Jaws and piranha to rule to the world! Everyone has resolutions, right? I think it’s a requirement for a new year. To build a new improved you. But, what if you don’t want a new you? I have worked hard over the last year to achieve my goals. I have goals for 2015. They just build on the previous goals, I don’t have any actual resolutions. I think perhaps that just makes me a lucky one. I know what I want to do and I just need to find the resolve to do it. Oh wait, that’s a resolution! #1: Make a Plan. Exercise, like everything else in our lives, doesn’t happen simply because we think about it. A week or more may go by after your make your resolution, and you have failed to actually follow through on that resolution. Deciding where you can fit exercise into your day is one of the most important points in following through on your plan. I personally liked to exercise when I got home after work. But after my schedule changed, I couldn’t do that, plus pick up the house, plus make dinner, plus all the other myriad things we do. So I became a morning person. I didn’t like it, but now I am used to it (I am not sure I can say I like it, but I am getting very good at it). My dad would be proud: he complained most of my life about my lack of morning skills. I find it satisfying to get my exercise done early, it clears up the rest of the day. When I get home, drained, I feel good knowing that I won’t be skipping my exercise because I already did it. You need to figure out what works best for you and put it in the calendar so you can’t avoid it. Second part of the plan is gear. What do you need to accomplish the exercise? I always suggest trying something new that doesn’t need a lot of investment or the equipment can be rented easily. Why spend $150 on running shoes to find out you would really rather play tennis? If you don’t like the sport you won’t stick with it. This is meant to be fun, not torture. Even if it feels like it the first few times out. My first running shoes cost $30, and my current only cost $65. Since you can run in just about any athletic clothes, it makes running a fairly inexpensive sport to try out. Remember it’s not about the gear, it’s about the exercise. Getting dolled up in tennis shorts and shoes with an expensive racket and heading out to the club is great. Just don’t forget to play tennis long and hard while you are there. #2: Track it. It’s hard to feel accomplished when you don’t know how you have improved. Conversely, you can feel accomplished if you don’t realize how little you are doing. I am sometimes surprised by how little I did when I look back at my week, although at the time I felt that I had a pretty good week going. I may have run five times, but if those runs were all “easy”, than I didn’t make any progress. For anyone with a smart phone (which is pretty much everyone except my husband), there are a ton of free apps available. Nike, Endomondo,Fitness Buddy, Fitocracy, the possibilities are endless. And that is just the free ones. Then there are the bracelets that track everything from sleep to activity: Fitbit, iFit, Garmin Vivofit. Of course, there is the good old pen and notebook method too. When I started running, I counted how many telephone poles were in a half mile via the car (11 to 12, if you are curious). Then I just counted poles to track how far I had gone. While I admit my gps tracker is much easier, my other method got the job done. I tracked my distance and times with an Excel sheet. More work, but just as effective. Keeping it simple is sometimes the best way. Don’t get so bogged down in how cool your fitness tracker is and how many ways it shows what you do that it isn’t actually showing anything. Again, not about the gear, just that you use it. Preparedness is great. But when you are prepared, get out there! #3: Work up to It. Obviously one knows not to decide to run one day and run a marathon the next. But one also doesn’t decide to run and then run 5 miles the next day either. Unless you are in really good shape from whatever other exercising you may have been doing. Even then, different sports use different muscles and you might still regret it the following day. When I got my first running injury, I thought “Whoohoo, I’m a real runner now!”. Fortunately, it didn’t take long to heal. And it wasn’t serious. But overdoing can cause a multitude of problems–serious and otherwise. Not the least of which means that you will be discouraged and not able to go back out there any time soon. #4: Keep it going. Cross training is an excellent way to increase your ability and prevent injuries. It is also is fantastic way to avoid boredom. Doing the same exercise or sport five or six times a week is a great way to burn out. We are back to “make it fun” here. I rotate through yoga, kickboxing and sometimes even Wii to keep me from getting bored. Try two or more rounds of tennis, boxing then bowling (switching hands in between rounds) if you don’t think Wii can be a good workout. Lunges and weights strengthen my legs and core to prevent injury when I am out running. When I don’t feel like getting out there to run or yoga doesn’t appeal, then I know it is time to do something else for a week or so. Everyone has different goals: getting in shape, losing weight, running a marathon, having fun are all good reasons to tie on a pair of sneakers. The hard part is to continue putting on those sneakers. Find something you like, and it will be a lot easier. A few years ago I discovered that running is one of the few things that actually convinces my body to lose weight. But, again, not enough to take it seriously. I had been trying the “little as possible for the greatest results” exercise plan. I like exercise and I get cranky without my yoga, but I hadn’t found my niche. And I like to eat, so as little as possible was still quite a bit. Then my brother picked up running again, and I thought, why not? (There’s that competitive streak–and perhaps a bit of sibling rivalry.) He has the same genes–in 2014 he did a Spartan run in August with his son. I am pretty sure I would still be trying to climb that rope….I am incredibly impressed that he did it: one day before his 46th birthday! This time,for me, the running is sticking. I guess I’m a late bloomer. I didn’t pick up football until my late thirties, but don’t bother me on a sunday in the fall! That was my husband’s doing, but my genes then kicked in. I watch more football now than my husband. My dad loved sports, as his dad loved sports. He played sports in college, ran until being a farmer took the time, and watched all sports on tv. I have fond memories of watching the World Series with Dad (and I don’t like baseball), and the Olympics were always watched in my parents’ house. And now mine. Dad would watch several games at once, when a commercial came on he would switch to the other game until a commercial came on and he would then check out the first. He watched college, professional, whatever was on. Occasionally, being such a great fan, he even watched through his eyelids. I myself have tried that technique, but somehow I always fall asleep and miss the good stuff. When I told my mother that I had my first 5k coming, she thought that was great. Then pointed out that Dad did 10ks so I had a bit further to go. So, a goal for this year.